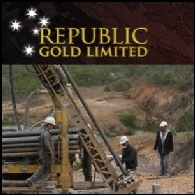 Republic Gold Limited is an explorer of gold, focusing on gold deposits in Australia's slate belt gold provinces. Its two projects in the Hodgkinson Basin are the Northcote Project (75%-owned) and the Tregoora Project (100%-owned). Drilling programs have been carried out by the Company on both projects. Republic has a coverage of exploration tenements and applications in the Hodgkinson Basin totaling approximately 5,000 square kilometers. Asian Activities Report for October 14, 2011 includes: Ironbark Zinc Limited (ASX:IBG) has entered into a US$50 million funding facility with Glencore International AG (LON:GLEN); Altura Mining Limited (ASX:AJM) has received Operation Production Mining approval for the Tabalong Coal Project in South Kalimantan, Indonesia; Republic Gold Limited (ASX:RAU) has entered into a Tenement Sale Agreement to sell its Far North Queensland assets to Territory Minerals Pty Ltd; Leighton Holdings Limited (ASX:LEI) today announced that its subsidiary Leighton Offshore had been awarded a major contract by Iraq&apos;s South Oil Company. Republic Gold Limited (ASX:RAU) are pleased to announce that the Company has appointed Mr Victor Barua to the position of General Manager of Operations for the Amayapampa Gold Project in Bolivia. This critical and significant appointment flags the beginning of the transition from exploration into development at Amayapampa. Republic Gold Limited (ASX:RAU) Advances Financing Plan for Amayapampa Gold Project With Jennings Capital Inc. The Directors of Republic Gold Limited (ASX:RAU) today announce that the Company has appointed Jennings Capital Inc. of Canada as its Canadian mergers & acquisitions and equity financial advisor in connection with a proposed structured and staged project financing of the Amayapampa Gold Project in Bolivia. Republic Gold Limited (ASX:RAU) today announce that the Company will embark upon a resource enhancement phase of drilling at the Amayapampa Gold Project ("Amayapampa" or "Project"). This drilling will seek to both optimise the current mineral resource and explore possible extensions to the orebody with the primary aim of increasing the recently reported ore reserve. Republic Gold Limited (ASX:RAU) are pleased to advise that the Company has successfully raised A$2 million through a placement of shares to institutional and sophisticated investors. Republic Gold Limited (ASX:RAU) today announce that the Company has entered into an arrangement with Burraga Copper Pty Ltd ("BCPL") where BCPL is buying the Company&apos;s Burraga assets in New South Wales for A$800,000. The Directors of Republic Gold Limited (ASX:RAU) today announce that the Company has successfully completed the Bankable Feasibility Study ("BFS") for its Amayapampa Gold Project in Bolivia ("Amayapampa" or the "Project"). In conjunction with the recently signed Social Licence Agreement at the Project, the Company can now advance negotiations to source the necessary development finance for the Project. 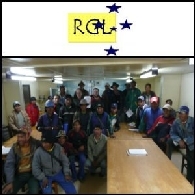 Republic Gold Limited (ASX:RAU) today announce that the Company, through its Bolivian subsidiary Minera Nueva Vista, has signed the Amayapampa Social Licence with Authorities from the communities around the Amayapampa Gold Project in Bolivia. Republic Gold Limited (ASX:RAU) ("Republic" or "Company") are pleased to advise that as part of the Company&apos;s increased focus on getting the Amayapampa Gold Project into production, the Board of Directors is reviewing the Company&apos;s exploration and development portfolio in Australia. Republic Gold Limited (ASX:RAU) today announce that the Company has purchased the interest held by its joint venture partner Astor Consultants Pty Ltd (&apos;Astor&apos;) in the Company&apos;s Burraga project, located in New South Wales. The Directors of Republic Gold Limited (ASX:RAU) are pleased to provide shareholders with an update on the Bankable Feasibility Study ("BFS") for the Amayapampa Gold Project in Bolivia ("Amayapampa" or the "Project"). Republic Gold Limited (ASX:RAU) are pleased to provide shareholders with an update on recent sampling activities at the Company&apos;s Burraga Copper Project in Central New South Wales ("Burraga" or "Project"). Auger drill samples were taken from the tailings dump from the turn of the 20th Century Lloyd&apos;s Copper Mine operations, plus grab samples from the extensive slag dumps dating to the same period. Republic Gold Limited (ASX:RAU) today announced that the Company has completed a placement of 146,666,667 shares at a price of 1.5 cents through Patersons Securities Limited ("Patersons"). The placement raised A$2.2M net of expenses. The response to the placement offering was very positive, despite extremely challenging market conditions. Funds from the placement will be used to progress development of the Company&apos;s 1.3Moz Amayapampa Gold Project in Bolivia ("Amayapampa"), its Burraga and Far North Queensland exploration projects in Australia and for ongoing working capital. Republic Gold Limited (ASX:RAU) are pleased to announce that the Company has received the final results of infill grade control trenching at its Amayapampa Gold Project ("Amayapampa" or the "Project") located in Bolivia. Republic Gold Limited (ASX:RAU) are pleased to announce that the Company has received the results from two exploratory trenches at its Amayapampa Gold Project ("Amayapampa" or the "Project") located in Bolivia. 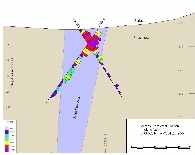 The two trenches (Nos 39 and 38) are located 530 metres and 600 metres respectively north of the currently proposed open pit and directly along strike from the mineralised zone within this design pit. One trench produced 5 metres at 22.4 g/t Au, which is consistent with the extensive trenching results already undertaken by the Company within the proposed open pit area. Republic Gold Limited (ASX:RAU) are pleased to advise that the Company has commenced operating at the Amayapampa Gold Project in Bolivia ("Amayapampa" or the "Project") under the Project&apos;s Environmental Licence that was granted in 2007. Republic Gold Limited (ASX:RAU) are pleased to announce that the Company has received the initial results of infill grade control trenching at its Amayapampa Gold Project ("Amayapampa" or the "Project") located in Bolivia. 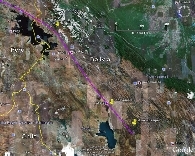 Republic Gold Limited (ASX:RAU) is pleased to advise that the Company has received news from the Ministry of Mining and Metallurgy that the realignment and bituminising of the main road leading to the Amayapampa Gold Project ("Amayapampa" or the "Project") located in Bolivia will be completed in June 2010. Republic Gold Limited (ASX:RAU) today announce that the Company has made significant progress towards finalising the Bankable Feasibility Study ("BFS") for the Amayapampa Gold Project ("Amayapampa" or the "Project") in Bolivia. The two major engineering contracting firms involved in completing the metallurgical component of the BFS, WorleyParsons (tailings dam and water supply) and Fraser Osborn (treatment plant design and costing) have made simultaneous and successful visits to Bolivia and the Project. Republic Gold Limited (ASX:RAU) are pleased to advise shareholders that the Company has settled its litigation with Black Isle Resources Corp (CVE:BIT), formerly Luzon Minerals ("BIRC"). Republic Gold Limited (ASX:RAU) today report on the Company&apos;s progress on advancing debt financing for a portion of the developments costs for its Amayapampa Gold Project ("Amayapampa" or the "Project") located in Bolivia. The Company is in the process of finalising a comprehensive financial plan to fully fund the costs of bringing the project into production. Republic Gold Limited (ASX:RAU) ("Republic" or the "Company") are pleased to advise that the Company has made significant progress at the Burraga Copper Project ("Burraga" or the "Project") located in the Lachlan Fold Belt in Central New South Wales. ABN Newswire stocks to watch today include: Texon Petroleum Limited (ASX:TXN), Mt Isa Metals Limited (ASX:MET) and Republic Gold Limited (ASX:RAU). Republic Gold Limited (ASX:RAU) are pleased to provide shareholders with an update on recent financing activities related to the Company&apos;s Amayapampa Gold Project in Bolivia ("Amayapampa" or "Project"). ABN Newswire stocks to watch today include: Pike River Coal Limited (NZE:PRC) (PINK:PKRRF), Beach Energy Limited (ASX:BPT) (PINK:BEPTF), FerrAus Limited (ASX:FRS) (PINK:FRRAF), Republic Gold Limited (ASX:RAU), Galaxy Resources Limited (ASX:GXY) (PINK:GALXF) and Mission NewEnergy Limited (ASX:MBT) (PINK:MIBFF). Republic Gold Limited (ASX:RAU) are pleased to provide shareholders with information on two new and important developments at the Company&apos;s Amayapampa Project in Bolivia ("Amayapampa" or "Project"); 1. The potential major increase of the treatment plant throughput rate to 2.7M tonnes per annum, and 2. The appointment of a local politician from near-by Llallagua, Senor Jose Pimentel as the new Minister for Mining and Metallurgy. ABN Newswire stocks to watch today include: Pan Asia Corporation Ltd (ASX:PZC), Texon Petroleum Limited (ASX:TXN), Republic Gold Limited (ASX:RAU), Galaxy Resources (ASX:GXY), and Stirling Resources (ASX:SRE). 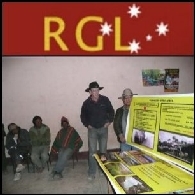 Republic Gold Limited (ASX:RAU) are pleased to provide shareholders with the following update on the Company&apos;s financial plan to secure funding for the development and construction of the Company&apos;s million ounce plus gold project at Amayapampa in Bolivia ("Amayapampa" or the "Project"), plus the appointment of technical consultants to work on the BFS. ABN Newswire tocks to watch today include: Galaxy Resources Limited (ASX:GXY) (PINK:GALXF), Environmental Clean Technologies Limited (ASX:ESI), Republic Gold Limited (ASX:RAU), Conquest Mining Limited (ASX:CQT) (PINK:CQMLF), Beach Energy Limited (ASX:BPT) (PINK:BEPTF), AusTex Oil Limited (ASX:AOK) (PINK:ATXDF) and Otto Energy Limited (ASX:OEL). The Australian sharemarket eased some early gains and closed slightly higher on Friday. This was the first weekly gain in five weeks while the global markets had been shadowed by China&apos;s monetary tightening, worries on US economic recovery stability and sovereign debt issue in Euro zone. Republic Gold Limited (ASX:RAU) today announced that the Company has completed its upgrade of the geological block model at the Amayapampa Gold Project ("Amayapampa" or "Project") in Bolivia. 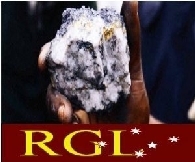 The mineral resource has been increased by 19.4% from 1,084,000 ounces to 1,294,000 ounces. 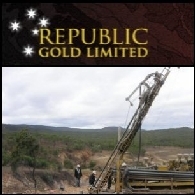 Republic Gold Limited (ASX:RAU) today announce that the Company has received results from the RC drilling programme undertaken in December 2009 at its 100%-owned Tregoora Gold Project in Far North Queensland. Drilling took place at the Terrace Creek, Sleeping Giant and Retina South Prospects with a total of 2,252 metres of RC percussion drilling completed before the wet season commenced. 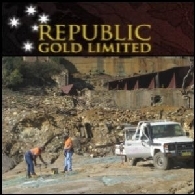 Republic Gold Limited (ASX:RAU) is pleased to provide a Quarterly Activities Report for the period ended 31 December 2009. 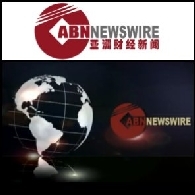 ABN Newswire Stocks to Watch today include: Otto Energy Limited (ASX:OEL)(PINK:OTTEF), Sarissa Resources Inc., (PINK:SRSR), Zhaojin Mining Industry Company Limited (HKG:1818)(PINK:ZHAOF), Galaxy Resources Limited (ASX:GXY)(PINK:GALXF), Automotive Technology Group (ASX:ATJ), Conquest Mining Limited (ASX:CQT) (PINK:CQMLF). Republic Gold Limited (ASX:RAU) today announced that the Company has engaged ICR to conduct an independent social study of the Amayapampa Gold Project ("Amayapampa" or the "Project") and an economic study of Bolivia concerning inward foreign investment. The resulting report will be used as a crucial Definitive Feasibility Study document and be provided to potential project financiers. 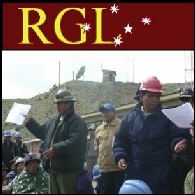 Republic Gold Limited (ASX:RAU) today announced that the Company has signed a Letter of Intent with the Government of the Department of Santa Cruz in Bolivia to work jointly towards exploration at the El Mutun Iron Ore Project in Eastern Bolivia. The Letter of Intent is signed by Raul Barrosa Saso, Secretary of Mining, Energy and Hydrocarbons for the Government of the Department of Santa Cruz. Republic Gold Limited (ASX:RAU) today announced that the Company will today commence a 5,000-metre RC drilling programme at its 100%-owned Tregoora Gold Project in Far North Queensland. Drilling will target mineralisation in the series of recently purchased mining leases in the central portion of the mineralised zone at Tregoora and in the vicinity of zones where recent high grade intersections were recorded. Republic Gold Limited (ASX:RAU) today announced that the Company has received initial metallurgical testwork results from samples of diamond drill core from the Amayapampa Gold Project in Bolivia ("Amayapampa" or the "Project") that were tested by Gekko Systems of Ballarat ("Gekko") using Gekko&apos;s unique gravity (inline pressure jig) and intensive leach technology. Republic Gold Limited (ASX:RAU) today announced that the Company has completed a placement of 150,000,000 shares at a price of 2.6 cents through Patersons Securities Limited ("Patersons"). The placement raised A$3.90M before expenses. The response to the placement offering was strong, with Patersons receiving offers for well in excess of the shares available. Republic Gold Limited (ASX:RAU) today announced that the Company has made significant progress on its upgrade of the resource model at the Amayapampa Gold Project ("Amayapampa or the Project") in Bolivia. All trenching and shaft sampling has been completed and the majority of the new surface topography is complete. This remodelling exercise is a major revamp of the previous geological block model containing 1.1Moz, with extensive new data being input. Republic Gold Limited (ASX:RAU) is pleased to provide to shareholders the September 2009 Quarterly Report which provides a summary of the progress made by the company. Republic Gold Limited (ASX:RAU) today announced that the Company&apos;s independent resources estimation consultant has completed work on a resource upgrade at the 100%-owned Tregoora Gold Project in Far North Queensland. This independent estimation has resulted in a significant increase of the Mineral Resource at Tregoora from 155,000 ounces to 229,000 ounces. This latest resource upgrade includes the maiden estimates from the Company&apos;s Terrace Creek prospect. Republic Gold Limited (ASX:RAU) today announced that the Company has completed the purchase of four mining leases that lie in the central Retina area at its 100%-owned Tregoora Project in Far North Queensland ("FNQ"). A drilling programme of approximately 3,000 metres is planned to commence once the drill rig has been mobilised and arrives on site. 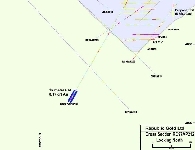 Republic Gold Limited (ASX:RAU) today announce that the Company has made advances with technical feasibility study work on the Amayapampa Project ("Project") aimed at completion of the Bankable Feasibility Study, with the near-completion of the surface sampling programme that has been ongoing since the start of the year and resurveying of the topography. The conclusion of both will allow the resource upgrade to be completed. The Directors of Republic Gold Limited (ASX:RAU) today announced that the Company has received analysis results for the final eight diamond drillholes for the 2009 field season drilling at its Sleeping Giant Prospect within its 100%-owned Tregoora Gold Project in Far North Queensland ("FNQ"). 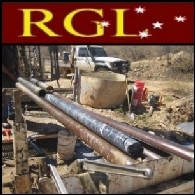 The Directors of Republic Gold Limited (ASX:RAU) today announced that the Company has received analysis results for the final 18 RC drillholes for the 2009 field season drilling at its Terrace Creek Prospect, within its 100%-owned Tregoora Gold Project in Far North Queensland ("FNQ"). Republic Gold Limited (ASX:RAU) today announces that it has paid a A$50,000 refundable deposit for the purchase of four granted mining leases at the Company&apos;s Tregoora Gold Project in Far North Queensland. The vendor has now signed all documentation necessary to effect the assignment of the mining leases. 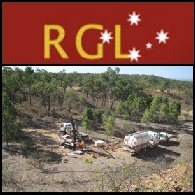 Republic Gold Limited (ASX:RAU) today announce that the Company has received analysis results for the initial four diamond drillholes for the 2009 field season drilling at its Sleeping Giant Prospect within its 100%-owned Tregoora Gold Project in Far North Queensland ("FNQ"). The Directors of Republic Gold Limited (ASX:RAU) today announce that the Company has, over the course of the past few days, mobilised earthmoving equipment to the Amayapampa Project in order to commence preliminary earthworks. Bolivia&apos;s Minister for Mining and Metallurgy, Sn. Luis Alberto Echazu, in a letter (original and translation below) to the Company last week, has given his full support for the Company&apos;s progressing with the Pre-Construction Phase of the Project. 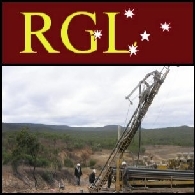 The Directors of Republic Gold Limited (ASX:RAU) today announce that the Company has received analysis results for the initial 14 RC drillholes for the 2009 field season drilling at its Terrace Creek Prospect, within its 100%-owned Tregoora Gold Project in Far North Queensland ("FNQ"). A total of two diamond drillholes have also been completed to provide geological interpretations and samples for ongoing metallurgical testwork. 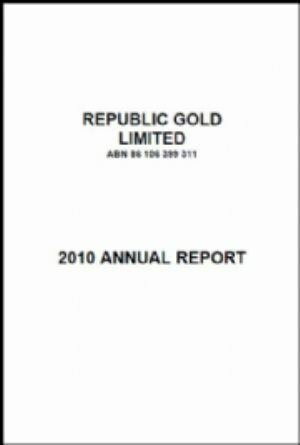 The board of Republic Gold Limited (ASX:RAU) present their Activities Report for the June 2009 Quarter. Highlights include; A 5% Mineral Resource upgrade at the FNQ Projects means that 72% of these resources are in the measured and indicated categories. 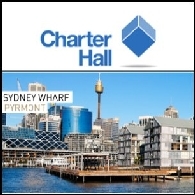 Placement and heavily oversubscribed underwritten Rights Issue raises A$4.89M. Directors and interests associated with directors, subscribed A$377,000 to the Rights Issue. Cash at the end of the Quarter was A$4.78M. The Board of Republic Gold Limited (ASX:RAU) today announces that Callabonna Uranium Limited ("Callabonna") has entered into an agreement to merge with MKY Resources Limited (ASX:MKY). Republic has a 7.23% interest in Callabonna and has agreed to the sale of all its Callabonna shares in exchange for new MKY shares. 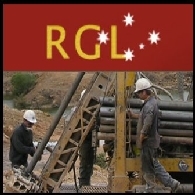 The Directors of Republic Gold Limited (ASX:RAU) today announce that the Company has commenced metallurgical drilling at its 100%-owned Tregoora Gold Project in Far North Queensland ("FNQ") and in preparation for resource definition drilling at Terrace Creek, has undertaken costeaning (or trenching), surface mapping and sampling. The Directors of Republic Gold Limited (ASX:RAU) today announce that the Company has commenced drilling at its 100%-owned Tregoora Gold Project in Far North Queensland ("FNQ"). The drilling will provide sample for an expanded metallurgical testwork programme and also attempt to upgrade the mineral resources at Tregoora with first estimation of mineral resources at the Terrace Creek Prospect following this current drilling programme. The Board of Republic Gold Limited (ASX:RAU) is very pleased to announce that the Rights Issue ("Issue") has closed with approximately 80% of all shareholder entitlements being taken up. The Australian shares were broadly higher. The benchmark S&P/ASX200 rose 76.4 points, or 2 per cent, at 3894.4, while the broader All Ordinaries gained 74.6 points, or 1.96 per cent, to 3887.9 points. Besides the strong lead from Wall Street, the rising commodities prices may also push up the market today. The Directors of Republic Gold Limited (ASX:RAU) are pleased to announce that following the initial successful surface sampling programme at its Amayapampa Gold Project in Bolivia (the "Project"), the sampling has been extended significantly due to continuing encouraging analysis results. The Directors of Republic Gold Limited (ASX:RAU) are pleased to announce that the Bankable Feasibility Study for its Amayapampa Gold Project in Bolivia is progressing well and work at the Project site continues as normal. 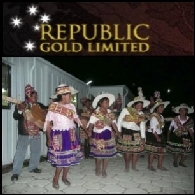 Republic Gold Limited (ASX:RAU) In response to overnight international press reports from Bolivian-based newspapers, the Company confirms that work at the Amayapampa Gold Project (&apos;Project&apos;) continues as usual, with the 255-strong workforce employed in the continuing surface sampling programme and various roadwork projects in and around the mine. Yesterday Australian shares closed lower on concern about the health of US banks. The benchmark the S&P/ASX200 index fell 0.6%, or 23.3 points, at 3867.1, while the broader All Ordinaries index was down 0.6%, or 22.1 points, at 3840.1. AUDIO: Republic Gold Limited (ASX:RAU) provides the opportunity to listen to an audio broadcast with Mr John Kelly, MD in a presentation titled "RAU - Placement and Underwritten Rights Issue - Mr John Kelly, Managing Director". Republic Gold Limited (ASX:RAU) are pleased to announce that the Company has closed a Placement for A$750,000 at 2.0 cents per share ("Placement") and signed an Underwriting Agreement for a 1-for-4 renounceable Rights Issue to all shareholders also at a price of 2.0 cents per share ("Rights Issue"). The Rights Issue is fully underwritten by Patersons Securities Limited. Republic Gold Limited (ASX:RAU) has appointed Mr Paul Pyke as its Project Development Manager. This is a new role with Mr Pyke&apos;s prime responsibility being to lead the completion of the two Bankable Feasibility Studies and get the FNQ and Amayapampa Gold Projects into production. Republic Gold Limited (ASX:RAU) today announce that the Company has increased its total Mineral Resources at the Hodgkinson Gold Project ("Project") in Far North Queensland ("FNQ") to 462,000 ounces. Yesterday Aussie shares closed slightly lower after the massive fall in the US market. The benchmark S&P/ASX200 index ended the day down 0.6%, or 22.3 points, at 3582.1, while the broader All Ordinaries index fell 0.6%, or 21.9 points, at 3532.3. The local market has become more immune to Wall Street’s negative leads in recent days. The Directors of Republic Gold Limited (ASX:RAU) today announce that the Company has completed the diamond drilling programme at Amayapampa Gold Project ("Project") and has completed most of the surface trench and pit sampling programme. Further trench and pit sampling was required to extend the original work into new areas, not previously considered mineralised. The Directors of Republic Gold Limited (ASX:RAU) today announce that the Company has increased the total Mineral Resources at the Amayapampa Gold Project in Bolivia ("Project") from 720,000 ounces to 1,084,000 ounces. This increases the Company&apos;s total Mineral Resources base to 1,582,000 ounces from the previous estimate of 1,218,000 ounces. Republic Gold Limited (ASX:RAU) provides the opportunity to listen to an audio broadcast with Mr John Kelly, MD in a presentation titled "RAU - Operations Update - Mr John Kelly, Managing Director". 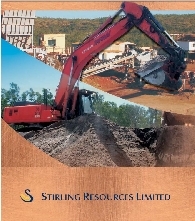 The Board of Republic Gold Limited (ASX:RAU) announces that the Company and Staldor Mining Pty Limited have completed an aircore drilling programme at the Kangaroo Creek Joint Venture Project (the "Project") mining and exploration leases south-west of Chillagoe in Far North Queensland. Republic Gold Limited (ASX:RAU) provides the opportunity to listen to an audio broadcast with Mr John Kelly, MD in a presentation titled "RAU - Tregoora Drill Results Terrace Creek High Grade Shoot - John Kelly - Managing Director ". The Board of Republic Gold Limited (ASX:RAU) today announces the results of the recent Stage 2 drilling programme for the 2008 field season at the Tregoora Gold Project in Far North Queensland. At Tregoora 24 holes were drilled for 1,436 metres. The Board of Republic Gold Limited (ASX:RAU) announces that the Company has commenced a 1,800 metre diamond drilling programme and surface sampling programme at the Amayapampa Gold Project in Bolivia. The Board of Republic Gold Limited (ASX:RAU) today announces the results of the recent Stage 2 drilling programme for the 2008 field season at the Northcote Gold Project in Far North Queensland. Republic Gold Limited (ASX:RAU) provides the opportunity to listen to an audio broadcast with Mr John Kelly, MD in a presentation titled "RAU - Republic Enters Contract For Highly Prospective Leases - John Kelly - Managing Director ". 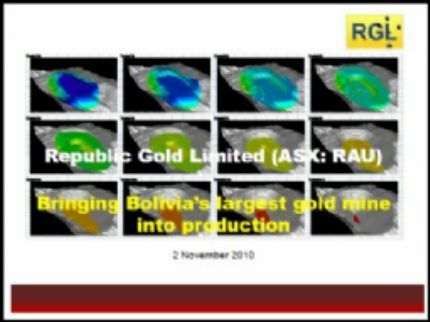 Republic Gold Limited (ASX:RAU) provides the opportunity to listen to an audio broadcast with Mr John Kelly, MD in a presentation titled "RAU - Completion of Joint Research Project - Mr John Kelly, Managing Director". 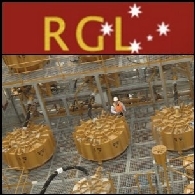 The Board of Republic Gold Limited (ASX:RAU) ("Republic" or the "Company") today announces the successful completion of a joint research Project between the CSIRO, the Queensland Department of Mines and Energy Geological Survey and the Company utilising the CSIRO&apos;s expertise in modelling mineralising systems. 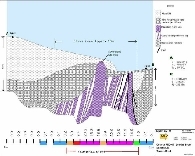 The Project has been successfully completed for the Hodgkinson Basin resulting in a computer modelling technique for predicting the location of mineral deposits. The Board of Republic Gold Limited (ASX:RAU)("Republic" or the "Company") today announces the results of the recent Stage 1 drilling programme for the 2008 field season at the Tregoora and Northcote Gold Projects in Far North Queensland. At Tregoora 31 holes were drilled for 2,029 metres (see Table 1) and 26 holes were drilled for 1,417 metres at Northcote. 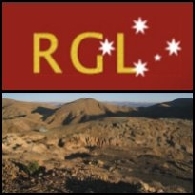 The Board of Republic Gold (ASX:RAU)("Republic" or the "Company") announces that the Company and Staldor Mining Pty Limited have now signed a Joint Venture Agreement ("Joint Venture") to explore and mine on a series of granted exploration and mining leases and lease applications that are highly prospective for tin and other heavy minerals. The Board of Republic Gold (ASX:RAU) announces that it has planned a 1,500 metre diamond drilling programme at the Amayapampa Gold Project in Bolivia. 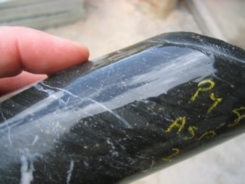 The aim of the programme is to check a number of high grade channel samples in the orebody and to extend the mineralisation to depth where a small number of drillholes and one channel sample indicate that the mineralisation has good potential for extensions at depth. The Board of Republic Gold Limited (ASX:RAU) announces that drilling for the Phase 1 drilling programme for the 2008 field season at its Far North Queensland projects has been completed. This drilling was aimed at providing intersections to be used in a resource upgrade for the Northcote and Tregoora Gold Projects. 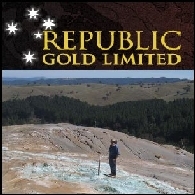 Republic Gold Limited (ASX: RAU) - Republic Targets 10M Cubic Metres Tin Bearing Alluvium - Mr John Kelly, Managing Director; Republic Gold Limited (ASX: RAU) present the following audio webcast regarding "RAU - Republic Targets 10M Cubic Metres Tin Bearing Alluvium - Mr John Kelly, Managing Director". You may also download this audio webcast to your computer or portable audio player. The Board of Republic Gold (ASX:RAU)("Republic" or the "Company") announces that it has signed a Heads of Agreement to enter into a Joint Venture with Staldor Mining Pty Limited ("Staldor Mining") to explore and mine on a series of granted exploration and mining leases and lease applications that are highly prospective for tin and other heavy minerals. The Company plans to commence an initial phase of work immediately, consolidating all of the historical geological data for one of the most prospective areas, the Kangaroo Creek Project, and then move into an alluvial mining phase at Kangaroo Creek. The Board of Republic Gold (ASX: RAU)("Republic" or the "Company") announces that it has received a positive petrology report for the Burraga Base Metals Prospect. 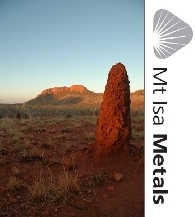 This report indicates that Burraga mineralisation fits what is known as the "carbonate-base metal" model of mineralisation. A number of significant mineral deposits of this style are located in the south-west Pacific Rim including Kelian, Gold Ridge, Mt. Kare, Porgera, Woodlark Island, Karangahake and Lake Cowal. Republic Gold Limited (ASX: RAU) - Appointment of New Director - Mr John Kelly, Managing Director; Republic Gold Limited (ASX: RAU) present the following audio webcast regarding "RAU - Appointment of New Director - Mr John Kelly, Managing Director". You may also download this audio webcast to your computer or portable audio player. The Directors of Republic Gold Limited (ASX: RAU)("Republic" or the "Company") today announce that the Company has appointed a new Non-Executive Director, Dato Choo Beng Kai. Dato Choo is a Malaysian national with extensive business interests in Malaysia through his role as Group Managing Director of Masmeyer Holdings Sdn Bhd. 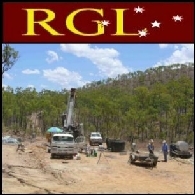 Republic Gold Limited (ASX: RAU) - Drill Rig To Commence Work In Far North QLD - Mr John Kelly, Managing Director; Republic Gold Limited (ASX: RAU) present the following audio webcast regarding "RAU - Drill Rig To Commence Work In Far North QLD - Mr John Kelly, Managing Director". You may also download this audio webcast to your computer or portable audio player. The Board of Republic Gold (ASX:RAU)("Republic" or the "Company") announces that drilling for the 2008 field season at its Far North Queensland projects will commence by the end of this week. The work to be undertaken will follow-up positive results received in new areas from last season&apos;s programme, with a view to obtaining information that will allow initial resource estimates to be calculated on some of these areas. Republic Gold Limited (ASX: RAU) - Significant Progress made on Amayapampa Gold Project - Mr John Kelly, Managing Director; Republic Gold Limited (ASX: RAU) present the following audio webcast regarding "RAU - Significant Progress made on Amayapampa Gold Project - Mr John Kelly, Managing Director". You may also download this audio webcast to your computer or portable audio player. The Directors of Republic Gold Limited (ASX: RAU)("Republic" or the "Company") today announce that significant progress has been recently made on the Amayapampa Gold Project in Bolivia, with Republic pushing forward with the update of the Amayapampa Bankable Feasibility Study as quickly as possible. The Board of Republic Gold (ASX: RAU)("Republic" or the "Company") today announces that the Company has recently visited the Chinese group that is interested in the Company in China. The Company&apos;s executives had a number of very useful meetings with the senior executives of this organisation, including site visits to one of the Chinese groups operations in Southern China. Republic Gold Limited (ASX: RAU) - Visit By The Company To China - Mr John Kelly, Managing Director; Republic Gold Limited (ASX: RAU) present the following audio webcast regarding "RAU - Visit By The Company To China - Mr John Kelly, Managing Director". You may also download this audio webcast to your computer or portable audio player. The Board of Republic Gold ("Republic" or the "Company")(ASX: RAU) today announces that the Company has recently hosted a third visit to Australia by the Chinese group that is interested in the Company&apos;s properties. The Company has now been invited to China to discuss the details of a potential co-operation agreement between the two groups. The Directors of Republic Gold Limited (ASX: RAU)("Republic" or the "Company") today announce that Republic has entered into a transaction with Vista Gold Corp ("Vista Gold") of North America to purchase the 720,000 ounce Amayapampa Gold Project in Bolivia ("Project"). The Board of Republic Gold ("Republic" or the "Company")(ASX: RAU) today announces that the Company&apos;s technical team has built a computer model for the Burraga Polymetallic Project in Central New South Wales. The new model provides multiple targets for the 2008 drilling field season with copper & gold and silver, lead & zinc targets to be drilled. 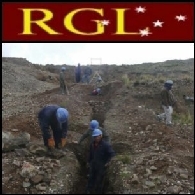 The Board of Republic Gold (ASX: RAU) today announces that Company directors and consultants spent several days last week with a delegation of senior executives from the major Chinese mining group that visited the Company in late 2007. The Board of Republic Gold (ASX:RAU)("Republic" or the "Company") today announces that it has received the last batch of analysis results from the recently completed drilling programme at the 75%- owned Burraga Copper Project that is located in mineral-rich Central New South Wales. Republic Gold Limited (ASX: RAU) - Purchase Offer For Mt Carbine Rejected - Mr John Kelly, Managing Director; Republic Gold Limited (ASX: RAU) present the following audio webcast regarding "RAU - Purchase Offer For Mt Carbine Rejected - Mr John Kelly, Managing Director". You may also download this audio webcast to your computer or portable audio player. Republic Gold Limited (ASX: RAU) - Regional Exploration Drilling at Tregoora - Mr John Kelly, MD; Republic Gold Limited (ASX: RAU) present the following audio webcast regarding "RAU - Regional Exploration Drilling at Tregoora - Mr John Kelly, MD". You may also download this audio webcast to your computer or portable audio player. The Board of Republic Gold ("Republic" or the "Company")(ASX: RAU) today announces the results of December&apos;s drilling programme at the Tregoora Gold Project in Far North Queensland. Republic Gold Limited (ASX: RAU) - Tungsten Mineralisation Encountered in 11 of 13 Wide-Spaced Drillholes at Whumbal West - Mr John Kelly, MD; Republic Gold Limited (ASX: RAU) present the following audio webcast regarding "RAU - Tungsten Mineralisation Encountered in 11 of 13 Wide-Spaced Drillholes at Whumbal West - Mr John Kelly, MD". You may also download this audio webcast to your computer or portable audio player. The Board of Republic Gold ("Republic" or the "Company")(ASX: RAU) today announces that it has received all of the analysis results from the recent drilling programme at the Whumbal West tungsten prospect in Far North Queensland that took place in November. 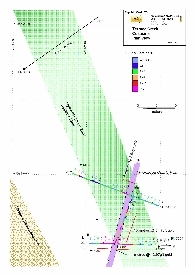 The drilling has been highly successful in encountering tungsten mineralisation in all but 2 drillholes. Planning for a Stage 2 drilling programme at Whumbal West will commence immediately. Republic Gold Limited (ASX: RAU) - Encouraging Multiple Mineralised Zones Encountered at Burraga - Mr John Kelly, MD; Republic Gold Limited (ASX: RAU) present the following audio webcast regarding "Encouraging Multiple Mineralised Zones Encountered at Burraga". You may also download this audio webcast to your computer or portable audio player. The Board of Republic Gold (ASX: RAU) today announces that it has received the third batch of analysis results from the recently completed drilling programme at the 75%-owned Burraga Copper Project that is located in mineral-rich Central New South Wales. Republic Gold Limited (ASX: RAU) - Highly Productive Visit by Chinese Delegation - Mr John Kelly, MD; Republic Gold Limited (ASX: RAU) present the following audio webcast regarding "Highly Productive Visit by Chinese Delegation". The Board of Republic Gold ("Republic" or the "Company")(ASX: RAU) today announces that over the past weekend the Company hosted a delegation of senior executives from a major Chinese mining group. This mining group has an annual turnover of approximately AUD$3B. The Board of Republic Gold ("Republic" or the "Company") (ASX:RAU) today announces that it has received the second batch of analysis results from the recently completed drilling programme at the 75%-owned Burraga Copper Project that is located in mineral-rich Central New South Wales. Republic Gold Limited (ASX: RAU) - Purchase Offer Made for Mt Carbine - Mr John Kelly, MD; Republic Gold Limited (ASX: RAU) present the following audio webcast regarding "Purchase Offer Made for Mt Carbine". You may also download this audio webcast to your computer or portable audio player. Republic Gold Limited (ASX: RAU) - Annual General Meeting Summary - Mr John Kelly, MD; Republic Gold Limited (ASX: RAU) present the following audio webcast regarding "RAU - Annual General Meeting Summary - Mr John Kelly, MD". You may also download this audio webcast to your computer or portable audio player. Republic Gold Limited (ASX: RAU) - Burraga Drilling Indicates a Polymetallic Deposit - Mr John Kelly, MD; Republic Gold Limited (ASX: RAU) present the following audio webcast regarding "Burraga Drilling Indicates a Polymetallic Deposit". You may also download this audio webcast to your computer or portable audio player. The Board of Republic Gold (ASX: RAU)("Republic" or the "Company") today announces that it has received the first results from the recently completed drilling programme at the 75%-owned Burraga Copper Project that is located in mineral-rich Central New South Wales. Republic Gold Limited (ASX: RAU) - Company Update - Mr John Kelly, MD; Republic Gold Limited (ASX: RAU) present the following audio webcast regarding "Company Update". You may also download this audio webcast to your computer or portable audio player. The Board of Republic Gold (ASX: RAU)("Republic" or the "Company") is very pleased to today announce that it has appointed Mr Neb Zurkic as the Company&apos;s new Technical Director. 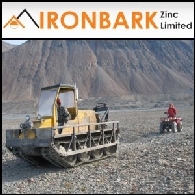 The Directors see this appointment as a significant coup for the Company given the calibre of Mr Zurkic as a geologist and his worldwide experience. The Board of Republic Gold (ASX: RAU)("Republic" or the "Company") today announces that it has arranged a placement of 76,434,220 shares to a group of sophisticated investors at a share price of 7.5 cents. Funds raised from this placement total $5,732,566.50. 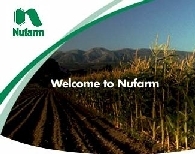 The placement pricing is based on an approximate discount of 15% on an estimate of the volume weighted average share price over the last five days, in line with the pricing of the Company&apos;s previous placement. Republic Gold Limited (ASX: RAU) - Share Placement and Appointment of Technical Director - Mr John Kelly, MD; Republic Gold Limited (ASX: RAU) present the following audio webcast regarding "Share Placement and Appointment of Technical Director". You may also download this audio webcast to your computer or portable audio player. Republic Gold Limited (ASX: RAU) - Drilling Update - Mr John Kelly, MD; Republic Gold Limited (ASX: RAU) present the following audio webcast regarding "Drilling Update". You may also download this audio webcast to your computer or portable audio player. Republic Gold Limited (ASX: RAU) - September Quarterly Report - Mr John Kelly, MD; Republic Gold Limited (ASX: RAU) present the following audio webcast regarding "September Quarterly Report". You may also download this audio webcast to your computer or portable audio player. Republic Gold Limited (ASX: RAU) - Whumbal West Sampling Encounters Significant Copper and Lead Anomalism - Mr John Kelly, MD; Republic Gold Limited (ASX: RAU) present the following audio webcast regarding "Whumbal West Sampling Encounters Significant Copper and Lead Anomalism". You may also download this audio webcast to your computer or portable audio player. Republic Gold Limited (ASX: RAU) - Drill Rig Commences Work at Mt Carbine - Mr John Kelly, MD; Republic Gold Limited (ASX: RAU) present the following audio webcast regarding "Drill Rig Commences Work at Mt Carbine". You may also download this audio webcast to your computer or portable audio player. Republic Gold Limited (ASX: RAU) - Placement - Mr John Kelly, MD; Republic Gold Limited (ASX: RAU) present the following audio webcast regarding "Placement". You may also download this audio webcast to your computer or portable audio player. Republic Gold Limited (ASX: RAU) - Results for Far North QLD Regional Sampling Programme - Mr John Kelly, MD; Republic Gold Limited (ASX: RAU) present the following audio webcast regarding "Results for Far North QLD Regional Sampling Programme". You may also download this audio webcast to your computer or portable audio player. Republic Gold Limited (ASX: RAU) - Quarterly Report June 2007 - Mr John Kelly, MD; Republic Gold Limited (ASX: RAU) present the following audio webcast regarding "Quarterly Report June 2007". You may also download this audio webcast to your computer or portable audio player. Republic Gold Limited (ASX: RAU) - Analysis Results New Tungsten Bearing Prospect FNQ - Mr John Kelly, MD; Republic Gold Limited (ASX: RAU) present the following audio webcast regarding "Analysis Results New Tungsten Bearing Prospect FNQ". You may also download this audio webcast to your computer or portable audio player.